We are your ideal maintenance partner for industrial 501K gas generators. For more than 26 years, operators throughout the world have benefitted from our unrivalled product knowledge and depth of capability. We have serviced over 1100 engines within our dedicated 501K maintenance facilities. And we are authorised by the OEM, so you know our work is backed by robust technical and engineering expertise. Operators both onshore and offshore depend on the industrial 501K as a source of power. You can depend on us to help keep your equipment running safely, reliably and cost-effectively. 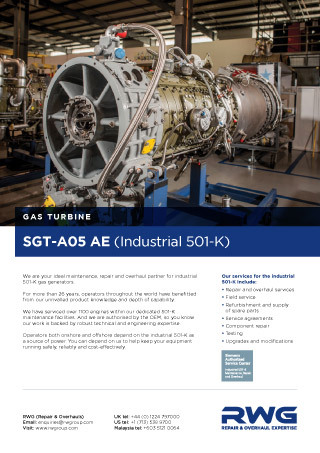 With a power range of 3.9 to 6.4 megawatts, the current 501K range of gas turbines draw up on 30 years of evolution. There are approximately 1500 501K engines in operation. These single shaft engines offer all the advantages of lightweight, aero-derivative design of modular construction, plus rugged, reliable performance, and are designed to run for four years on base load duty. All 501K gas generators can be configured to run on gas, liquid or dual fuels at thermal efficiencies of up to 31%. And Dry Low Emissions (DLE) technology is available on most configurations. With a dedicated industrial 501K team of more than 60 highly skilled people, you know your engines are in safe hands at RWG. Our workshops are equipped with cutting edge technologies. We have the capacity to support up to 50 engines each year. And our product specialists apply the latest techniques and innovations to every engine and component that passes through our facilities. Our capability extends across the full range of industrial 501 KA, KB, KC, KH engines, as well as KF, K17, K34 and MT5 marine versions. No matter what model of industrial 501K you operate, we can support it. We have a 42,000 sq ft dedicated service centre in Houston, Texas for 501K engine overhaul and component repair, as well as two sophisticated performance test facilities, in Texas and California. And as an RWG customer, you’ll benefit from our 24/7 global field service support. We are committed to ensuring the availability of your equipment. We bring our expertise to you, wherever and whenever you need us. We are proud to be the OEM’s worldwide distributor for industrial 501K exchange combustion liners. This service is brought to you through our unique Combustion Liner Exchange Program (CLEP) from our Houston service centre. All parts delivered through CLEP are fully overhauled by OEM approved vendors in accordance with OEM procedures. Our exclusive CLEP program means you benefit from the just in time availability of high quality repaired parts. This minimises your equipment downtime and returns your 501K gas generators to operational service safely and reliably. Get in touch with us to discuss your industrial 501K gas generator service requirements.